Baccarat is offered at the English Casino in the live casino under English speaking guidance. 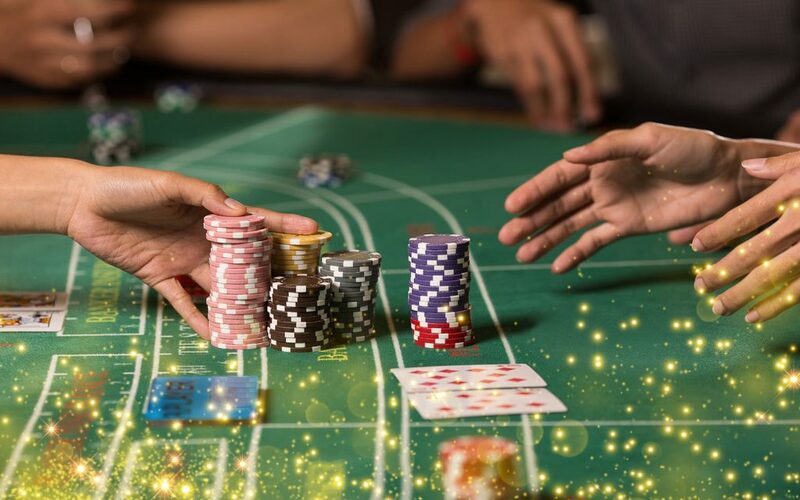 If you are going to play baccarat for the first time, which is also known as punto banco, it is useful to know the rules. For this reason, a brief explanation of the game rules baccarat will also be given here. It starts with the explanation of the goal and that is that the player and the bank with their cards as close to 9 points as possible. You bet on winnings for the player, profit for the bank or if you think it is a draw, you bet on it. If you think the player is going to win, you bet money on that. Do you think the bank will win this time, then you put the chips on the betting field of the bank. There is a tie in a draw. This option is relatively uncommon with baccarat and therefore also provides the highest profit. The payout is in fact a ratio of nine to one. After placing the bet, the cards are divided and the player and the bank each receive two cards. All cards with an image, such as farmer, wife and king have a value of 0 points. There is not worked with dozens with this card game. A card with a 2 and a farmer would be above the ten points and therefore the ten are deducted. Other cards have their own value with the exception of the bait which has a value of one. A player or bank can never get a hand with more than three cards. After the first two cards have been dealt, the outcome is determined and the player or the bank is closest to the number of points of 9. If the player has an 8 and the bank has a 7 then the player has won. If the bank and the player have much lower cards, then a fixed system determines whether another card is dealt. The game rules baccarat are briefly explained above. If you want to know all ins and outs of the game, then it is advisable to first deepen your knowledge. The card game is played very fast and you can follow the game better if you know how the game goes and when a player or bank gets a third card. The fixed rules for baccarat relate to the moment when a card needs to be added. The bank receives a card if it has three points and if the player does not have eight points with the third card. In the latter case, the player has already won. At four points in front of the bank, there is one more card when the third card of the player gives between two and seven points. Does the third card of the player score between four and seven points? If the bank has five points, there will be another card. Does the player with the third card have between six or seven points? Then the bank will receive another card if there are six points for the bank. The bank fits when there is a point total of seven points. The maximum number of cards is always three. Then the game is over. Then has won on the bank or the player. Or is the number of points equal? In that case, there is a tie or’tie’. The latter yields the highest wins, because the payout is 1 to 1 for the winnings or losses of the player. If you know the baccarat rules, you have the choice to gamble online or live . It is more convenient to play online first if you do not fully know the rules. Then you have control yourself when it comes to the game speed. In the live casino at the gaming table where the dealer is, you go with the dealer pace. Then you have limited time to invest money and thus make choices. That time is in the online casino in principle as long as you want. That is quite a difference and as a novice baccarat player is to take this into account. The moment you know the baccarat rules through and through, it is also fun to go to the live casino. That is immediately a step up when it comes to the game experience that is much more intense . It is of course nice if you are in Oranje Casino to watch the live table for baccarat. Then you immediately see how it goes and when you are ready to gamble live. If you know the baccarat rules and are a beginner, it is still possible to gamble for free. That is one of the best ways to master the game right from the start. In that case you do not have to pay attention to the money and see if you lose or win. You then have all the attention for the game with the full concentration. After free baccarat you have the option to start with a low bet in Oranje Casino. The bet is always adjustable and so it is possible to alternate.